The first week of the season is the first chance we get to see the teams playing meaningful games. In that extremely small sample size, our greatest hopes and our worst fears are realized. What we see in the first week reaffirms our hope for the season, or reaffirms the reasons why some teams could be in for long summers. To put your minds at ease, we at Standing Room Only are here to separate the fact from the fiction from your early-season overreactions. For some fans, there’s no reason to worry. For others though, the small sample size could be a sign of worse things to come. Madison Bumgarner will hit double-digit home runs this season. Fiction. Giants ace Madison Bumgarner had himself a game on Opening Day in Chase Field. He had 5.2 innings of perfect baseball before giving up 3 runs in the sixth, two of them on an AJ Pollock home run. More impressively, he helped himself out at the plate, going 2-2 with 2 homers. For those of you keeping track at home, that gives him a slugging percentage of 4.000. Bumgarner’s 2 home runs is still tied for the league lead as of Thursday afternoon. Two homers. A total of 838 feet. So how many home runs can Bumgarner hit this year? According to Baseball Reference, no pitcher has ever hit double-digit home runs in a season. The most home runs in a season by a pitcher came in 1931, when Wes Ferrell hit 9 for the Cleveland Indians. The most Bumgarner’s hit in a season is 5, a mark he reached in 2015. If he stays healthy, Bumgarner would have to hit 8 more home runs in about 35 more games; an average of 1 home run every four games. Very few batters average a home run every four games; spread out over a full season, that would result in 40 home runs, a mark only 8 batters reached in 2016. Bumgarner is a decent batter–not just for a pitcher–but breaking a record that has stood since 1931 seems unlikely. The Yankees pitching staff is in for an awful season. Fiction. The Yankees went 1-2 in their first series of the season against the Rays. The two losses came from poor performances from Masahiro Tanaka (2.2 IP, 7 ER) and Michael Pineda (3.2 IP, 4 ER), with the sole win coming behind a 5-inning, 3-hit start from veteran C.C. Sabathia. Tanaka had a rough Opening Day for the Yankees. It’s simply too early to be concerned about the Yankees pitching staff at the moment. Tanaka put up fantastic numbers in the spring, posting a 0.38 ERA through 23.2 innings. Pineda had a 4.32 ERA with 21 strikeouts in spring training, a bit down from his 4.82 ERA over the 2016 season. Two bad starts isn’t enough to make me truly worried about this rotation, though I wouldn’t put them in any “best rotation in baseball” conversations anytime soon. Sam Dyson will be demoted from the closer position for the Rangers. Fact, though it won’t happen immediately. No one is having a worse opening week than Sam Dyson. In the first game against the Indians, he blew the save in the 9th inning after giving up 3 runs. He came back on Wednesday to blow another save, serving up a grand slam to Francisco Lindor. In the short season, he is 0-2 with a 72.00 ERA. Ouch. Dyson won’t get demoted after two bad games, no matter how bad they are. But he won’t finish the season as the Rangers closer. The position itself can be volatile; about 1 in 3 closers get demoted during the season. Dyson even got the job through Shawn Tolleson’s demotion in 2016. With Matt Bush as a strong arm in the Rangers ‘pen, expect Dyson to be moved out of the ninth inning sooner rather than later. The Giants’ bullpen will blow over 25 saves this season. Fiction. It was the worst kind of deja vu for Giants fans in the season opener. After stellar pitching from Mad-Bum, the Giants bullpen–including newly-acquired closer Mark Melancon–blew the save en route to a 6-5 Opening Day loss to the D-Backs. The Giants blew 30 saves last season, most in the majors. While the optics of the situation doesn’t look good, the Giants bullpen has made significant improvements since last season, particularly in bringing in Mark Melancon. In his 8+ years in the majors Melancon has compiled a 2.63 ERA, blowing just 24 saves in 445 games. They may not be the best ‘pen in the country, but the Giants will have more stability in the later innings than they did last season. The Indians are favorites in the American League. Fact. I know, the Astros and the Red Sox are both undefeated too. But let’s focus on Cleveland for a second. The big question surrounding the Indians was how they would bounce back after coming oh-so-close to the Commissioner’s Trophy in 2016. If the first series against the Rangers is any indication, the loss in Game 7 has given them more motivation than heartbreak. On Opening Day, they overcame a rough start from ace Corey Kluber to put away the Rangers 8-5, helped by Edwin Encarnacion’s first homer as an Indian. In Game 2 they held off a late rally to win 4-3. 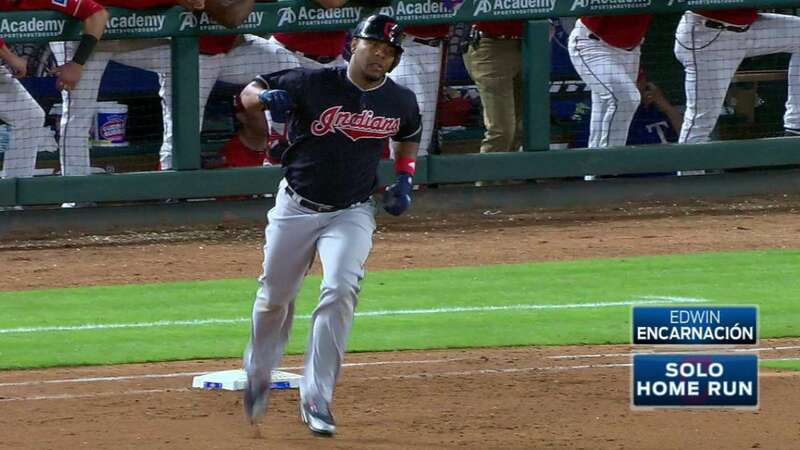 The cherry-on-top came with Francisco Lindor’s 9th-inning grand slam on Wednesday to put the Indians up on the Rangers for good. The “Edwing” comes to the Land. The Indians proved two important points in their sweep of Texas. One, don’t sleep on their lineup. Most of the talk has been about Cleveland’s great starting pitching, but their bats have the capability to put up crooked numbers too, with 21 runs in three games this season. More importantly, the Indians displayed the clutch gene that got them to the World Series last season. Cleveland put the rest of the American League on alert in just one series. This team looks good.